Background: Silver nanoparticles play a profound role in the field of biology and medicine due to its attractive physiochemical properties. Objective: The present work was aimed to develop green approach for the synthesis of silver nanoparticles (DRAgNPs) using D. zibethinus rind aqueous extract and determination of its antimicrobial and cytotoxic effect against brine shrimp. Materials and Methods: Aqueous extract of D. zibethinus rind was used to reduce silver nitrate to silver nanoparticles. The various reaction parameters were optimized, and DRAgNPs were characterized for size, shape, and nature. Results: Surface plasmon resonance confirmed the formation of DRAgNP's with maximum absorbance at λmaxof 418 nm. Scanning transmission electron microscopy and transmission electron microscope images revealed the morphology of the DRAgNPs were spherical with size range of 20 and 60 nm. Atomic force microscopy images confirmed the average particles size of DRAgNPs was to be 55 nm. The stability of the nanoparticles was also confirmed by the zeta potential which was found to be −15.82 mV. X-ray powder diffraction and energy-dispersive X-ray spectroscopy analysis confirmed the nature and the presence of Ag. DRAgNPs showed considerable antimicrobial activity against Salmonella typhimurium, Escherichia coli, Salmonella typhi, Staphylococcus aureus, Staphylococcus haemolyticus, and Bacillus subtilis, and exhibited better cytotoxicity against brine shrimp (LC50 =2.55 mg/mL). Conclusion: Based on the present study, it can be concluded that the green synthesis of silver nanoparticles using D. zibethinus rind is an eco-friendly and inexpensive method, and DRAgNPs could be used in the field of water treatment, pharmaceuticals, biomedicine, biosensor, and nanotechnology in the near future. Abbreviation used: SEM: Scanning transmission electron microscopy; TEM: Transmission electron microscope; AFM: Atomic force microscopy; XRD: X-ray powder diffraction; EDX: Energy-dispersive X-ray spectroscopy. Green synthesis of silver nanoparticles using D. zibethinus rind is an eco-friendly and inexpensive method. In recent years, nanotechnology has emerged as a promising strategy that can surmount problems of existing mode of therapies. Owing to their unique chemical and physical properties, nanoparticles have been implicated in the field of optics, catalysis, biology, medicine, and pharmaceutical science. Numerous approaches, using chemicals or electrochemical, are used in the preparation of nanoparticles. In general, many of these strategies are having difficulty in the purification stage since the used chemicals or the by-products formed are hazardous and high energy required for the preparation. Apart from the toxicity problem, controlling the size/shape and attaining the monodispersity are the other major challenges which are frequently encountered by the researchers in the preparation of nanoparticles. To address all these problems, plant extracts have been evolved as one of the most promising options in the synthesis of nanoparticles. The plant's constituents have both protective and reduction properties, which are essential for the reduction of metal ions to their corresponding nanoparticles. The major advantages of this method for the synthesis of nanoparticles could be as related to the absence of any intricate processes such as complex purification steps and maintenance of the microbial cell cultures. In the last two decades, there is a rising need to develop innovative technologies in the biosynthesis of nanoparticles since the nanotechnology and biotechnology have received increasing attention in the biosynthesis of nanoparticles. Most of the reported environmentally benign methods are associated with various problems such as lack of stability, crystals growth, and aggregation of the particles. Silver nanoparticles play a profound role in the field of biology and medicine due to its attractive physiochemical properties. Silver products have been used for centuries to prevent and treat a variety of diseases, most notably infections due to its strong inhibitory and bactericidal effects. Biosynthesized silver nanoparticles have been reported to possess antimicrobial activity,,, anti-inflammatory effect, antiviral, anti-angiogenesis, and antidiabetic activities. Durio zibethinus (Durian) plant is a member of Malvaceae family and has been known for antioxidant, antidiabetic, antihyperlipidemic, and antiproliferative activities. Moreover, the nutritional and health properties of D. zibethinus have also been reported. The medicinal properties of D. zibethinus fruit have been attributed by the presence of several bioactive compounds such as flavonoids, tannins, polyphenols, carbohydrates, protein, vitamins B and C, calcium, potassium, iron, manganese, sodium, magnesium, and copper. The presence of lignin, hemicelluloses, celluloses, and pectin in the D. zibethinus rind was also reported by Hokputsa et al. Zahran et al. reported that pectin was one of the essential elements in the biosynthesis and capping of silver nanoparticles. The present study was designed with an objective to utilize aqueous extract of D. zibethinus fruit rind in green synthesis of silver nanoparticles and the evaluation of their biological and cytotoxic properties. The effect of reaction time, silver nitrate concentration, and extract concentration on the synthesis of D. zibethinus rind-mediated silver nanoparticles (DRAgNPs) was also studied. Further, the antimicrobial potential of DRAgNPs was evaluated against various bacterial strains such as Salmonella typhimurium, Escherichia coli, Salmonella typhi, Staphylococcus aureus, Staphylococcus haemolyticus, and Bacillus subtilis. In addition, the brine shrimp cytotoxicity assay was also conducted since this assay has been used to assess the cytotoxicity and thus could be extrapolated for cell-line toxicity and antitumor activity. Fresh and healthy D. zibethinus rinds were collected from the local market (Sungai Petani, Kedah, Malaysia). Silver nitrate, Muller-Hinton agar, and nutrient broth were procured from Himedia Laboratories Pvt. Ltd., Mumbai, India. The fresh and healthy D. zibethinus rinds were surface sterilized with distilled water and then incised into small sizes. The rinds were soaked and rinsed with 70% methanol and air-dried at room temperature. About 20 g of dried D. zibethinus rinds were boiled with 200 mL of deionized water for 10 min and cooled. Then, the extract was filtered through the Whatman filter paper No. 1, and it was centrifuged for 15 min at 5300 rpm. The supernatant was collected and stored in an amber color bottle at 4°C for further use. One milliliter of the D. zibethinus rind extracts was added to 9 mL of 1 mM AgNO3 solution in a 10-mL volumetric flask and kept in sunlight for 60 min. A change in color of the solution to brown, indicate the biological reduction of AgNO3. The formation of DRAgNPs was also confirmed by spectrophotometric determination. The biosynthesis reaction of DRAgNPs depends on certain important parameters, i.e., time of reaction, concentration of silver nitrate, and volume of D. zibethinus rind extract required for the reaction. These parameters are key in qualitatively determine the size, shape, yield, and agglomeration state of the DRAgNPs. All these parameters were optimized for the green synthesis of DRAgNPs. The long-term stability of the synthesized DRAgNPs was determined using ultraviolet–visible (UV–Vis) spectroscopy. An aqueous dispersion of DRAgNPs was prepared and stored at ambient temperature in a 50-mL volumetric flask covered with aluminum foil. Aliquots of the sample were withdrawn at 1-week intervals for 120 days to measure changes in the UV–Vis spectra. The surface plasmon resonance (SPR) shift and the plasmon intensity of the colloidal DRAgNPs were characterized by UV-Visible spectra (Shimadzu UV-Vis. spectrophotometer, model AV-1800) in the wavelength range of 400–700 nm. The morphology and size of the DRAgNPs were confirmed using scanning transmission electron microscopy (SEM), FE-transmission electron microscope (TEM) (JEM-2100F, JEOL Ltd., JAPAN), and Atomic force microscopy (AFM) (Nano Scope, Ica, Vecco, USA) analysis; elemental composition using EDX analysis (FESEM-EDX, Oxford-Instrument INCA400); and surface capping functional groups using Fourier-transform infrared (FTIR) (FTIR-JASCO 4100 Spectrometer at 4000 to 400 cm−1). The zeta potential of DRAgNPs was determined using Zetasizer Ver. 7.03 (ELC-Z Zeta potential and particle size analyzer, Photal Otsuka Electronics, Japan). The crystallinity of DRAgNPs was confirmed by X-ray powder diffraction (XRD) pattern of nanoparticles (DMAX-2500, Rigaku Corporation, Japan). Synthesized DRAgNPs were tested for its antimicrobial activities against Gram-positive (S. aureus ATCC 43300, S. heamolyticus ATCC 29970, and B. subtilis ATCC 6633) and Gram-negative (S. typhi ATCC 7251, S. typhimurium ATCC 14028, and E. coli ATCC 25922) bacteria by using disc diffusion, minimum inhibitory concentration (MIC), and minimum bactericidal concentration (MBC) assay. The MIC assay was carried out using the broth microdilution assay. The serial dilution of DRAgNPs of seed and rind was added to the 48-well microtiter plates. Muller-Hinton (MH) broth was used as the broth medium, and the bacteria cultures were adjusted to 0.5 MacFarland. Then, 0.1 mL of the suspension was added to each well and incubated at 37°C for 24 h. The lowest concentration of DRAgNPs that inhibited the bacterial growth after 24 h was taken as MIC value. About 50 μL from all wells from 48-well microtiter plates used for MIC were inoculated in MH agar medium, and the plates were incubated at 37°C for 24 h. The concentration that kills 100% bacteria is the MBC value. The bacteria were grown in LB broth was used to spread evenly on the LB agar using L-rod. Sterile disc of 6-mm diameter of Whatman no. 1 paper was impregnated with the different concentrations of DRAgNPs (4 mg/mL) in water. For negative and positive controls, deionized water and gentamycin (1 mg/mL) were used, respectively. The zone of inhibition for D. zibethinus rind extract and silver nitrate was also determined. Then, the impregnated paper discs were placed in the LB agar plates and incubated for 24 h at 37°C. The test was performed in triplicates, and the zone of inhibition was calculated to determine the susceptibility of the bacteria. Artemia cytotoxicity assay is the simplest screening assays for testing the toxicity of bioactive materials. Using capillary glass tube, ten live and healthy larvae of A. salina were transferred from brighter part of the hatching chamber and placed into 24 well plates containing various concentrations (1–5 mg/mL) of DRAgNPs in 1 ml of sterilized seawater. Sterilized seawater without DRAgNPs was used as a negative control and maintained at 25°C for 24 h (16 h light filled and 8 h dark filled). After incubation, the percentage of larval mortality was calculated from the number of larvae surviving in each test concentration. The assay was carried out in triplicate, and the LC50 was determined using regression plot. 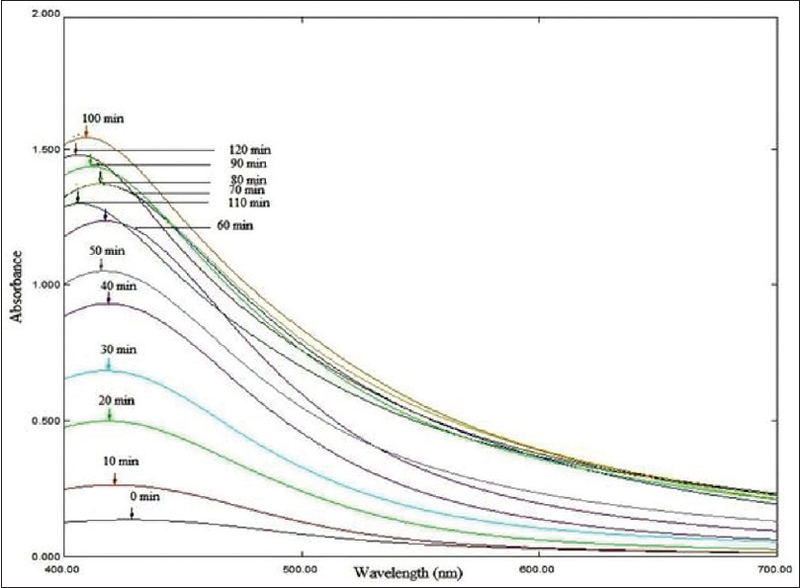 The synthesized DRAgNPs solution exhibited maximum absorbance at 418 nm [Figure 1] in UV–Visible spectrophotometry. Initially, the reaction was carried out with fixed concentration of silver nitrate (1 mM) and rind extract (1 mL) at different conditions such as room temperature, at 60°C, dark, and sunlight. The reactant solution kept at room temperature for 72 h, heated at 60°C for 1 h, and kept at dark for 72 h did not show any significant color change and absorbance peak in UV–Vis spectral studies. It was only observed a significant change in color, and absorbance in the reactant solution kept at sunlight (approximately 4000 ± 200 lux) for 10 min. Subsequently, the parameters, such as time of reaction, concentration of silver nitrate, and volume of D. zibethinus rind extract required for the synthesis of DRAgNPs, were optimized. The silver nitrate concentration was altered (0.5 mM to 3 mM) to investigate the optimum concentration needed to maximize the yield of silver nanoparticles. The study indicated the optimum concentration of silver nitrate solution required for the complete formation of silver nanoparticles was 2 mM. The rind extract's volume was altered (0.5–3 mL) to investigate the optimum volume of rind extract needed to maximize the yield of silver nanoparticles. Further, it was noticed that the volume of extract increased from 0.5 to 2 mL, and the reduction of silver nitrate occurs more rapidly to form silver nanoparticles. However, if the volume of rind extract was increased; further, there was no significant improvement in silver nanoparticle formation. Even though, we have selected 1 mL as the optimum concentration of rind extract required for DRAgNPs formation since the extra absorbance peak was observed near at 500 nm in UV–Vis spectrum for higher concentrated D. zibethinus rind extract. The reaction time for silver nanoparticles formation was altered (0–120 min) to investigate the optimum time needed to maximize the yield of silver nanoparticles. Silver colloid obtained at 60 min showed the ideal absorbance, and then there was no further significant increase in absorbance without much change in wavelength when further increase in time of reaction. From our findings, it was observed that 60 min was the optimum time required for the complete formation of silver nanoparticles [Figure 1]. SEM data revealed that the size of synthesized nanoparticles was found to be around 25–60 nm, with an average size of 48 nm [Figure 2]a. However, the TEM image showed that the particles size ranging from 15 to 58 nm with an average size of 45 nm [Figure 2]b, and selected area electron diffraction of DRAgNPs is shown in [Figure 2]c and d shows the EDX spectrum of biosynthesized DRAgNPs, which confirmed the presence of elemental silver signals of the biosynthesized DRAgNPs. The morphological feature and the nanoscale imaging were also observed by AFM. 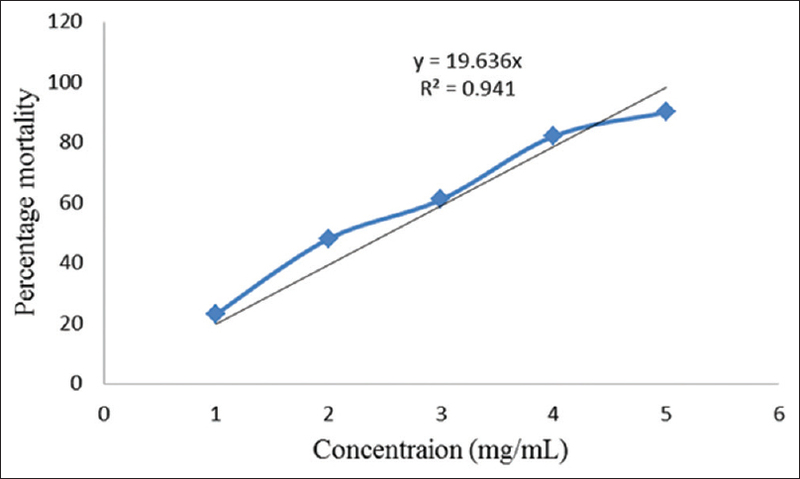 The measurement with the green synthesized nanoparticles was performed at scan rate of 0.3 Hz and 5 μm scan size. Different areas were examined on the same surface with the scanning area of 1.5 μm × 1.5 μm. Based on AFM intensity measurements, the average size of the DRAgNPs was measured to be ~55 nm [Figure 2]e. In the XRD pattern [Figure 3]a, five prominent diffraction peaks were observed at 2 θ = 38.08°, 44.26°, 64.24°, 77.42°, and 81.36°, which correspond to (111), (200), (220), (311), and (222) Bragg's reflections of the face-centered cubic (fcc) structure of metallic silver, respectively. The mean hydrodynamic diameter of DRAgNPs was found to be, 175.9 d.nm with intercept 0.806, and a low polydispersity index of 0.317 [Figure 3]b was observed in dynamic light scattering (DLS) analysis. 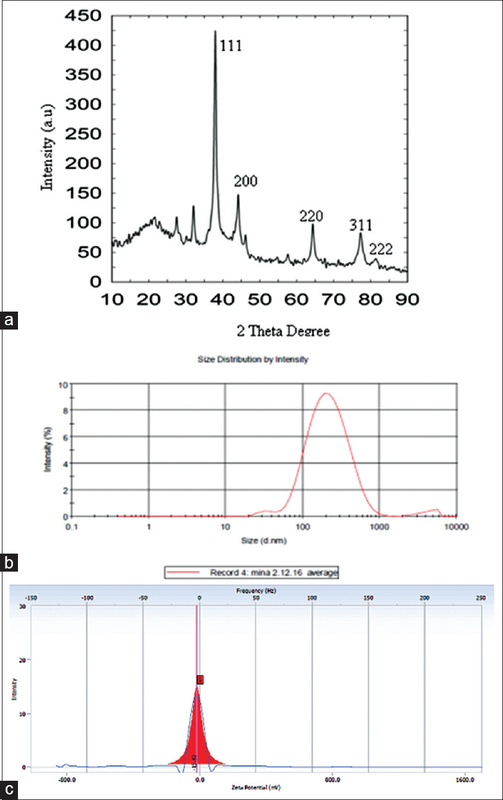 The stability of the nanoparticles was also confirmed by the zeta potential which was found to be −15.82 mV [Figure 3]c. The FTIR spectrum of DRAgNPs showed sharp intensive peaks at 3586 cm−1 (phenolic OH stretching), 3430 cm−1 (aromatic N-H stretching), 3308 cm−1 (OH stretching of phenol and alcohol), 3167cm−1 (C-H stretching), 1632 cm−1 (amide I bond of proteins due to carbonyl stretch in proteins), 1512 cm−1 (aromatic ring stretching), 1372 cm−1 (C-C bond of aromatic ring or amide group-II), 1310-1290 cm−1 (aromatic secondary amine CN stretching), 1081 and 1293 cm−1 (stretching vibrations of C-N aromatic and aliphatic amines), and 650 cm−1 (C-H of alkynes). The stability of the synthesized DRAgNPs in aqueous dispersion was evaluated based on changes in the absorption maxima of the SPR band for 120 days. The SPR bands remained almost symmetrical within the tested period. Further, there was no significant shift in the surface plasmon absorption peak indicating that the biosynthesized DRAgNPs was not aggregating during the storage period under ambient conditions. The MIC test results of DRAgNPs indicated that the minimum inhibitory concentration of DRAgNPs against S. heamolyticus, B. subtilis, and E. coli was found to be 4 mg/mL, and against S. typhimurium and S. typhi was found to be 2 mg/mL. Meanwhile, MBC results indicated that the MBC of 4 mg/mL of DRAgNPs against S. typhimurium and S. typhi. This is evident by the values of diameter of the zone of inhibition obtained during the assessment of antimicrobial activity [Table 1]. From the results, it could be stated that the newly synthesized silver nanoparticles were found to exhibit promising antimicrobial effect against the tested pathogens. It was observed that the maximum antimicrobial activity was against S. typhimurium, S. heamolyticus, and S. aureus followed by B. subtilis, E. coli, and S. typhi. However, it was also observed that the synthesized silver nanoparticles exhibited better activity against all the tested bacteria when compared to AgNO3 and D. zibethinus rind aqueous extract alone. Interestingly, DRAgNPs did not show better inhibitory activity against any of the tested bacteria when compared to reference drug gentamycin. It may be due to the higher concentration of gentamycin (1 mg/mL) used. In the present study, we assessed the cytotoxicity of DRAgNPs against brine shrimp. The brine exposures to DRAgNPs were conducted in the absence of food. The positive control (5 mg/mL of AgNO3) showed about 3% mortality in 24 h. Control group results clearly demonstrated the experimental mortalities were not due to deprivation from food. Meanwhile, it was observed that there was no effect of D. zibethinus rind extract on the survival of the larvae of brine shrimp for 24 h. The LC50 value of the synthesized colloidal DRAgNPs was found to be 2.55 mg/mL whereas the highest mortality of 90.0% was observed at 5 mg/mL. In the present study, green synthesis of silver nanoparticle was achieved by bioreduction of silver nitrate using D. zibethinus rind aqueous extract as a reducing and capping agent. The selection criteria for D. zibethinus rinds could be related to the factors, such as presence of pectin, which is responsible for the reduction of Ag+ in reaction solution and stabilization of formed silver nanoparticles, abundancy in the area of research, and as a rind that causes environmental pollution. Aqueous extract of D. zibethinus rind was used to reduce of AgNO3 into Ag 0, the color change from colorless to yellowish brown confirms the reduction. The maximum absorbance exhibited by reaction solution at 418 nm [Figure 1] is the characteristic SPR peak of DRAgNPs. Factors, such as size and shape of particles formed, could influence the SPR peak formation. Based on the results, it could be concluded that 1 mL extract of 10% D. zibethinus rind in deionized water, 2 mM AgNO3 concentration, ratio of rind extract and silver nitrate was 1:9, and 60 min reaction time in sunlight was the optimized condition for the synthesis of DRAgNPs. The present study dealt with the D. zibethinus rind-mediated silver nanoparticles synthesis using D. zibethinus rind aqueous extract, which might be instigated by the presence of pectin in the extract as mentioned by Nadezhda et al. that the –COO−, –OH, and O present in the side chains of pectin fragments were involved in the development of silver nanoparticles. Pectin and its fragments forming a hydrogen bond through its COO− and CH2 groups with silver molecules, and by the action of steric hindrance leads to restrain the formed silver nanoparticles from further agglomeration. The capping could also be facilitated by the proteins and enzymes present in the rind extract. SEM and TEM are commonly used to provide images about the morphology, size, shape, and organization of the surface topography of specimens. The SEM image [Figure 2]a clearly showed that all the particles were spherical, polydispersed, and absence of agglomeration. SEM and TEM image showed that the average size of DRAgNPs was 48 nm [Figure 2]a and 45 nm [Figure 2]b, respectively. In EDX spectrum, besides the high intense peak, few tiny weak peaks of Ca, Cl, and Cr were also observed, which owing to the bounded biomolecules onto the biosynthesized DRAgNPs. In AFM, the sizes of nanoparticles were with the same average size and uniformly distributed. The surface roughness under AFM was predicted to be moderate, and no prominent agglomeration was noticed. The estimated size of these silver nanoparticles is in agreement with the size observations from SEM and TEM analyses. In the XRD, the peaks observed [Figure 3]a in the pattern were in good agreement with reference to fcc structure from the Joint Committee of Powder Diffraction Standard Card No-087-0720. The DLS analysis was carried out to determine the hydrodynamic diameters of DRAgNPs. 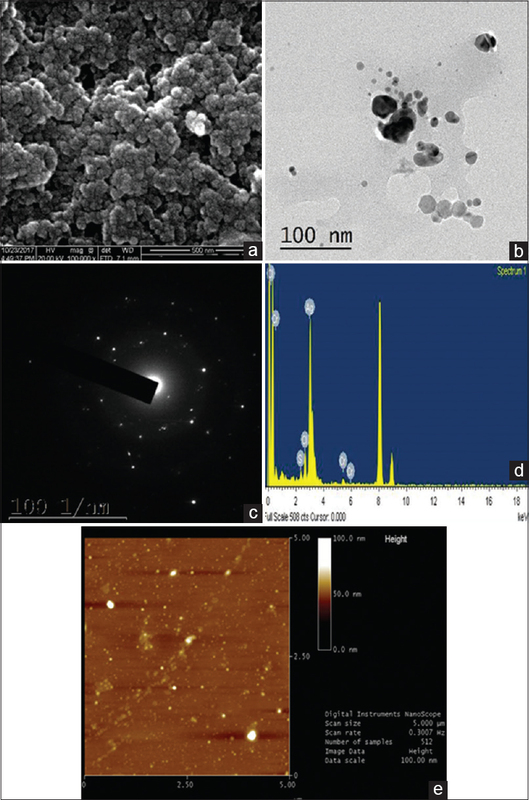 A higher value of the average size of nanoparticles was observed in DLS analysis in comparison to the SEM and TEM analysis, and it could be attributed by the agglomeration of nanoparticles. DLS technique measures the hydrodynamic radii of the nanoparticles, which include the solvent layer and capping at the interface. The negative zeta potential value of DRAgNPs reflects the presence of bio-organic components in the extract as a capping agent. The zeta potential value indicated that the synthesized DRAgNPs was moderately stable. The specific mechanism by which the biomolecules present in biological extracts assist in the synthesis of nanoparticles is yet to be fully elucidated. However, phytochemicals and plant-derived polysaccharides, such as cellulose, starch, and dextran, had been reported to play dual roles as a reducing and capping agents in plant inspired synthesis of nanoparticles. The possible groups responsible for interaction between the capping agents and DRAgNPs were confirmed using the FTIR. The results clearly indicated that the O-H, C-C, and C-N vibration stretches in DRAgNPs could be due to the presence of pectin, amino acids, and polyphenols in the extract of D. zibethinus rind which might be involved in the formation of DRAgNPs by acting as capping and stabilizing agents. Currently, a serious problem in treating various infectious diseases is the increase of bacterial resistance to antimicrobial agents. Increasingly, new bacterial strains have emerged with dangerous levels of resistance including both of Gram-positive and Gram-negative bacteria. It is important to prevent the emergence and spreading of multiresistant bacterial strains and to develop new antimicrobial substances which could be used to manage bacterial resistance. In this study, the silver nanoparticles synthesized by using D. zibethinus rind aqueous extract showed a fairly significant antimicrobial action on the tested bacterial pathogens. Our present study results are comparable with the study reported by Shriniwaset and Subash that the biosynthesized silver nanoparticles using terpenes rich extract of Lantana camara leaves showed better antimicrobial activity against S. aureus than E. coli. In another study, AgNPs from Ocimum tenuiflorum, Solanum trlcobatum, Syzygium cumini, Centella asiatica, and Citrus sinensis exhibited antimicrobial activity against S. aureus, P. aeruginosa, E. coli, and K. pneumoniae. The highest activity of nanoparticles was observed against S. aureus and E. coli. The antimicrobial activity of colloidal silver nanoparticle was found to be higher than the plant extract alone. Lee et al. synthesized silver nanoparticles from Dryopteris crassirhizoma and found them to be highly effective against B. cereus and P. aeruginosa. Similarly, silver nanoparticles obtained from leaf extract of banana, neem, and black tulsi were also active against E. coli and Bacillus sp. The mechanism of the bactericidal effect of silver nanoparticles against bacteria is not well known. Silver nanoparticles may attach to the surface of the cell membrane and disturb its power function such as permeability and respiration. The particles bind to the bacteria depending on the surface area available to interact. Smaller particles with larger surface area will exhibit more bactericidal effect than the larger particles. Morones et al. had demonstrated that the silver nanoparticles were found inside the bacteria as well as on the surface of the cell membrane using scanning tunneling electron microscopy and the X-ray energy-dispersive spectrometer. The finding clearly reveals the possibility of silver nanoparticles penetrating inside the bacteria and fungi, causing damage by interacting with DNA. Silver tends to have a high affinity to react with such compounds. The other possibility would be that nanoparticles release silver ions, which will have an additional contribution to the antimicrobial properties of silver nanoparticles. 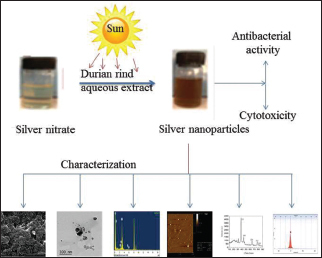 The present study results demonstrate the ability of the D. zibethinus rind extract in the synthesis of silver nanoparticles, and their significant antimicrobial activity represents the advancement in nanomaterial with realistic implications. Artemia species are zooplankton such as copepods and daphnids, and they play a vital role in the energy flow of the food chain in marine environment. Artemia species have been used in testing acute toxicity of toxic materials such as heavy metals and pesticides. “They offer distinct advantages such as year-round availability, low cost, ease of culture, high offspring production, short lifecycle, and no feeding required during the essay that led to the development of a wide range of Artemia-based standard bioassays.”, Artemia salina (Brine shrimp) lethality test is a simple preliminary test used to detect the antitumor activity of compounds, and it has been reported in elsewhere for cytotoxicity studies of terrestrial plants, extracts, and nanoparticles. The results indicated that the lethality was found to be directly proportional to the concentration of DRAgNPs. The percentage mortality rates of different concentration of DRAgNPs against Artemia are depicted in [Figure 4]. Interestingly, our results are found to comparable with the results reported by Arulvasu et al. They studied the cytotoxic effect of chemically synthesized silver nanoparticles against Artemia and reported that the LC50 value was around 10 nM concentration. They had also assessed the aggregation of AgNPs in the gut region of nauplii and the DNA damage of single cell of Artemia. However, our cytotoxicity study results exhibited less cytotoxic effect against Artemia then the results as reported by Avinash et al. They had reported that the LC50 value of the neem leaf extract mediated silver nanoparticles was 331.08 ppm. In another study, Phull et al. reported the brine shrimp lethality using green synthesized silver nanoparticles from crude extract of Bergenia ciliate where LC50 was around 33.92 mg/mL, which is comparatively less toxic than the currently synthesized DRAgNPs in our study. Since the synthesized DRAgNPs showed better lethal toxicity against Artemia in the present study, it can be further tested for antitumor activity using advanced methods and be used in the management of cancer along with other anticancer drugs as carrier and active principle. Nevertheless, it is safer for aquatics ecology since the concentration of synthesized DRAgNPs may be comparatively less than the toxic concentration in aquatics environment by industrial waste or any other environmental pollution. D. zibethinus rind aqueous extract was used successfully to synthesize silver nanoparticles. These DRAgNPs seemed to exhibit microbial inhibitory effect against human pathogens and also shown cytotoxicity against the brine shrimp. Meanwhile, the synthesized DRAgNPs are not toxic to aquatics since the LC50 of DRAgNPs is less than the possibility of silver nanoparticles in water. Therefore, they could be applied in pharma industry, water purification, and textile industries. The study results could be concluded that the plant-mediated nanoparticles can be used against human pathogens as a potential therapeutic agent and in the purification of wastewater in the near future. The authors (SS, SV, SS, SVC, SK, and VR) record appreciation Fundamental Research Grant Scheme (FRGS/1/2015/SKK08/AIMST/02/1), Ministry of Education, Malaysia (http://portal.mygrants.gov.my/main.php). The funder had no role in study design, data collection and analysis, decision to publish, or preparation of the manuscript. The authors are also pleased to acknowledge AIMST University, Malaysia, and the Department of Biological Engineering, Inha University, Republic of Korea, for providing the necessary facilities to carry out this work. The research work was financially supported by Fundamental Research Grant Scheme (FRGS/1/2015/SKK08/AIMST/02/1), Ministry of Education, Malaysia (http://portal.mygrants.gov.my/main.php). Mukunthan KS, Elumalai EK, Patel TN, Murty VR. Catharanthus roseus: A natural source for the synthesis of silver nanoparticles. Asian Pac J Trop Biomed 2011;1:270-4. Narayanan KB, Sakthivel N. Green synthesis of biogenic metal nanoparticles by terrestrial and aquatic phototrophic and heterotrophic eukaryotes and biocompatible agents. Adv Colloid Interface Sci 2011;169:59-79. Vigneshwaran N, Ashtaputre NM, Varadarajan PV, Nachane RP, Paralikar KM, Balasubramanyan RH. Biological synthesis of silver nanoparticles using the fungus Aspergillus flavus. Mater Lett 2007;61:1413-8. Medina-Ramirez I, Bashir S, Luo Z, Liu JL. Green synthesis and characterization of polymer-stabilized silver nanoparticles. Colloids Surf B Biointerfaces 2009;73:185-91. Otunola GA, Afolayan AJ, Ajayi EO, Odeyemi SW. Characterization, antibacterial and antioxidant properties of silver nanoparticles synthesized from aqueous extracts of Allium sativum, Zingiber officinale, and Capsicum frutescens. Pharmacogn Mag 2017;13:S201-S208. Veerasamy R, Xin TZ, Gunasagaran S, Xiang TF, Yang EF, Jeyakumar N. Biosynthesis of silver nanoparticles using mangosteen leaf extract and evaluation of their antimicrobial activities. J Saudi Chem Soc 2011;15:113-20. Ravichandran V, Shalini S, Vasanthi S, Shaa SA, Harish R. Green synthesis of silver nanoparticles using Atrocarpus altilis leaf extract and the study of their antimicrobial and antioxidant activity. Mat Lett 2016;180:264-7. Nadworny PL, Wang J, Tredget EE, Burrell RE. Anti-inflammatory activity of nanocrystalline silver in a porcine contact dermatitis model. Nanomedicine 2008;4:241-51. Rogers JV, Parkinson YW, Choi JL, Speshock SM, Hussain M. A preliminary assessment of silver nanoparticle inhibition of monkeypox virus plaque formation. Nanoscale Res Lett 2008;3:129-33. Gurunathan S, Lee KJ, Kalishwaralal K, Sheikpranbabu S, Vaidyanathan R, Eom SH, et al. Antiangiogenic properties of silver nanoparticles. Biomaterials 2009;30:6341-50. Shanker K, Mohan GK, Hussain MA, Jayarambabu N, Pravallika PL. Green biosynthesis, characterization, in vitro antidiabetic activity, and investigational acute toxicity studies of some herbal-mediated silver nanoparticles on animal models. Pharmacogn Mag 2017;13:188-92. Toledo F, Arancibia-Avila P, Park YS, Jung ST, Kang SG, Heo BG, et al. Screening of the antioxidant and nutritional properties, phenolic contents and proteins of five durian cultivars. Int J Food Sci Nutr 2008;59:415-27. Leontowicz H, Leontowicz M, Haruenkit R, Poovarodom S, Jastrzebski Z, Drzewiecki J, et al. D. zibethinus (Durio Zibethinus murr.) cultivars as nutritional supplementation to rat's diets. Food Chem Toxicol 2008;46:581-9. Hokputsa S, Gerddit W, Pongsamart S, Inngjerdingen K, Heinze T, Koschella A. Water-soluble polysaccharides with pharmaceutical importance from D. zibethinus rinds (Durio zibethinus Murr. ): Isolation, fractionation, characterisation and bioactivity. Carbohydr Polym 2004;56:471-81. Zahran MK, Ahmed HB, El-Rafie MH. Facile size-regulated synthesis of silver nanoparticles using pectin. Carbohydr Polym 2014;111:971-8. Prakash S, Ahila NK, Sri Ramkumar V, Ravindran J, Kannapiran E. Antimicrofouling properties of chosen marine plants: An eco-friendly approach to restrain marine microfoulers. Biocatal Agric Biotechnol 2015;4:114-21. Lefsih K, Delattre C, Pierre G, Michaud P, Aminabhavi TM, Dahmoune F. Extraction, characterization and gelling behavior enhancement of pectins from the cladodes of Opuntia ficus indica. Int J Biol Macromol 2016;82:645-52. Mulvaney P. Surface plasmon spectroscopy of nanosized metal particles. Langmuir 1996;12:788-800. Nadezhda VI, Natalya NT, Lydmila AE, Vasilyi AB. The study of the reaction of pectin-Ag (0) Nanocomposites formation. Int J Carbohydr Chem 2012;2012:ID459410. Park Y. New paradigm shift for the green synthesis of antibacterial silver nanoparticles utilizing plant extracts. Toxicol Res 2014;30:169-78. Patil Shriniwas P, Kumbhar Subhash T. Antioxidant, antibacterial and cytotoxic potential of silver nanoparticles synthesized using terpenes rich extract of Lantana camara L. Leaves. Biochem Biophys Rep 2017;10:76-81. Logeswari P, Silambarasan S, Abraham J. Synthesis of silver nanoparticles using plants extract and analysis of their antimicrobial property. J Saudi Chem Soc 2015;19:311-7. Lee JH, Lim JM, Velmurugan P, Park YJ, Park YJ, Bang KS, et al. Photobiologic-mediated fabrication of silver nanoparticles with antibacterial activity. J Photochem Photobiol B 2016;162:93-9. Banerjee P, Satapathy P, Mukhopahayay A, Das P. Leaf extract mediated green synthesis of silver nanoparticles from widely available Indian plants: synthesis, characterization, antimicrobial property and toxicity analysis. Bioresour Bioprocess 2014;1:3. Kokkali V, Katramados I, Newman JD. Monitoring the effect of metal ions on the mobility of Artemia salina nauplii. Biosensors (Basel) 2011;1:36-45. Vanhaecke P, Persoone G, Claus C, Sorgeloos P. Proposal for a short-term toxicity test with artemia nauplii. Ecotoxicol Environ Saf 1981;5:382-7. Arulvasu C, Jennifer SM, Prabhu D, Chandhirasekar D. Toxicity effect of silver nanoparticles in brine shrimp artemia. Scientific World Journal 2014;2014:256919. Avinash B, Supraja N, Santhi Priya C, Prasad TN, Alpha Raj M. Synthesis characterization and evaluation of the antimicrobial activity of neem leaf extract-mediated silver nanoparticles. Int J Pure Appl Biosci 2017;5:776-86. Phull AR, Abbas Q, Ali A, Raza H, Ja Kim S, Zia M. Antioxidant, cytotoxic and antimicrobial activities of green synthesized silver nanoparticles from crude extract of Bergenia ciliate. Future J Pharm Sci 2016;2:31-6.